Who doesn’t love radioactive dinosaurs, especially when their eyes flash red and they scream a scream which will send cold chills up your spine every time you wander too close? Even better, who doesn’t love such a beastie if he’s small enough to sit on your television cabinet and occasionally freak out your cats? 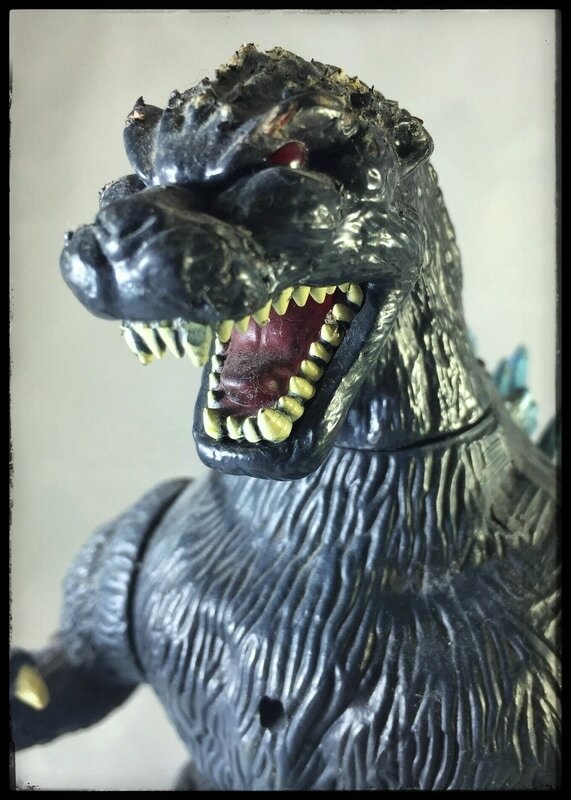 This particular screaming Godzilla is from Toho Toys and was released in 1995. Now nearly two decades old, it’s still one of my favorite toys though more for nostalgic reasons than because it’s a particularly well-crafted figure. This is the classic Godzilla, complete with the lumpy body and waddling stance somewhat reminiscent of a toddler with a loaded diaper. The hard plastic skin is a dark green-blue and deeply grooved. The spines along the back are pale blue tipped with silver. 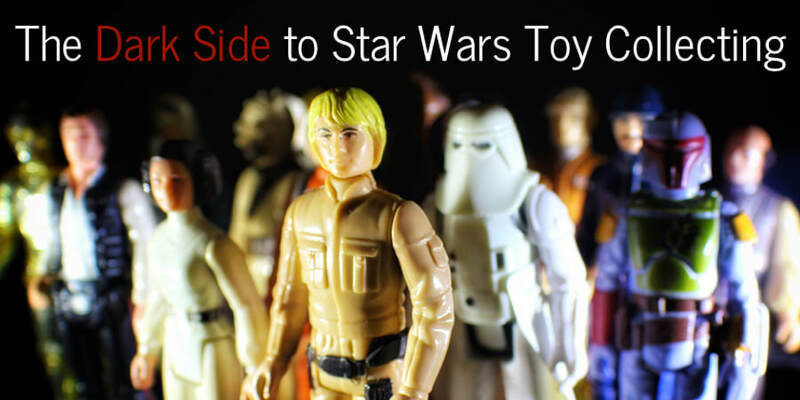 The toy’s articulation is limited to a head which rotates side to side and limbs which move up and down. The tail can be moved circularly or even removed if you’re so inclined. 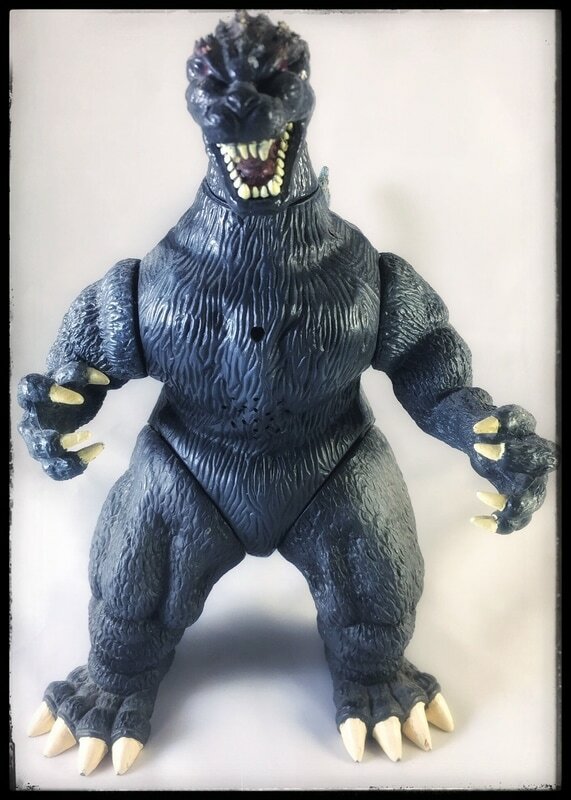 The limited articulation and obvious joints are both a pet peeve of mine, but when I think back on the classic Godzilla movies, the big guy didn’t have a particularly wide range of motion to begin with. He mostly just plodded along, sometimes swinging his upper body when he needed to deliver a tail smack to Gamora or some other monstrous enemy. In this light, I suppose the limited articulation is pretty close to the theatrical Godzilla and must therefore be forgiven. As I indicated above, some of the toy’s more exciting features include a motion sensor in the chest which causes the LED eyes to flash red and the toy to roar. Unfortunately, the back spines don’t light up like they did in the films. That would’ve been a fun touch, I think. The motion-induced sound effect is pretty typical of toys from the mid-90s to early-2000s, as you’ll remember this was the era of Big Mouth Billy Bass, that annoying singing fish which began a sensation for some reason. Personally, I’d rather listen to Godzilla roar than Billy squawk out “Don’t Worry, Be Happy.” One word of caution, the batteries do wear out fairly quickly and the tiny battery access panel has tiny screws which can easily be stripped. As a result, replacing batteries is nearly impossible. Points off for very poor engineering there, Toho Toys. 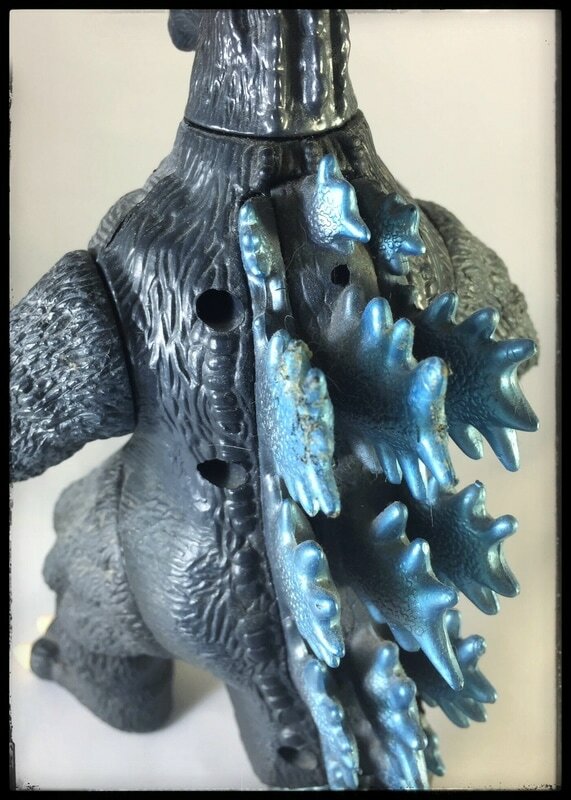 I couldn’t find much background information on this toy, due largely to the plethora of virtually identical Godzilla toys which have flooded the market for decades. 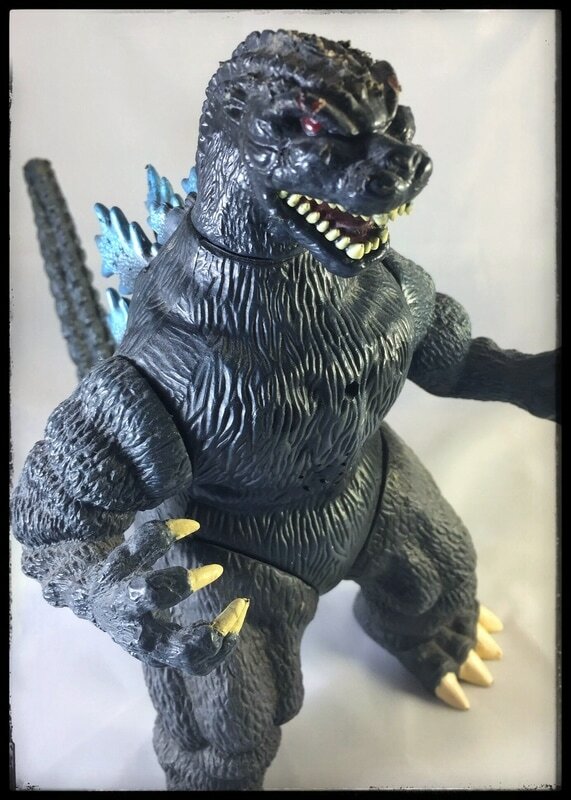 If you’re a Godzilla fan, you’d probably enjoy this toy and they can still be found online starting at around $10.00 each, which is probably about half what I paid for it in ’95.